While I was thumbing through the October issue the Jaguar Enthusiasts Club magazine I stumbled across an article about the MK7 Jaguar. 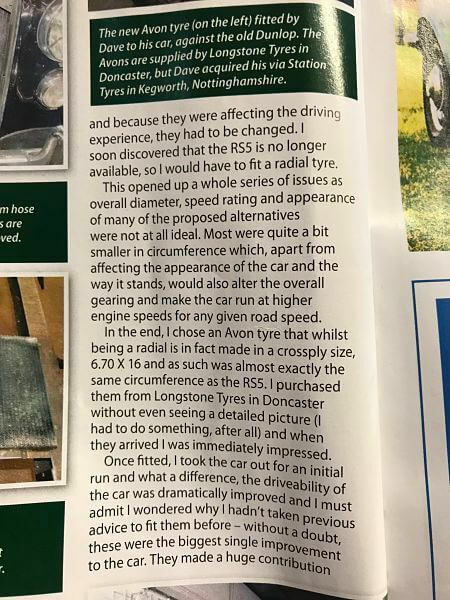 While giving his MK7 a big old cuddle David Marks addressed the situation of what tyres to fit. Which he explains in the text from the article we have shown here. The Goal posts have moved about what are the best tyres for these big MK 7 Jaguar saloons. Historically there was not a radial tall enough, and the original Crossply 670H16 Dunlop RS5 , until a few years ago was available. Until quite recently the Dunlop RS5 was, in my mind, by far the best crossply tyre for post war cars. But sadly Dunlop no longer make any historic road tyres. The MK7's original Dunlop 670H16 Dunlop RS5 had an overall diameter of 732mm tall. At the time the tallest radials were the 185VR16 Pirelli Cinturato CA67 and the 185SR16 Michelin X which were an inch smaller in diameter. 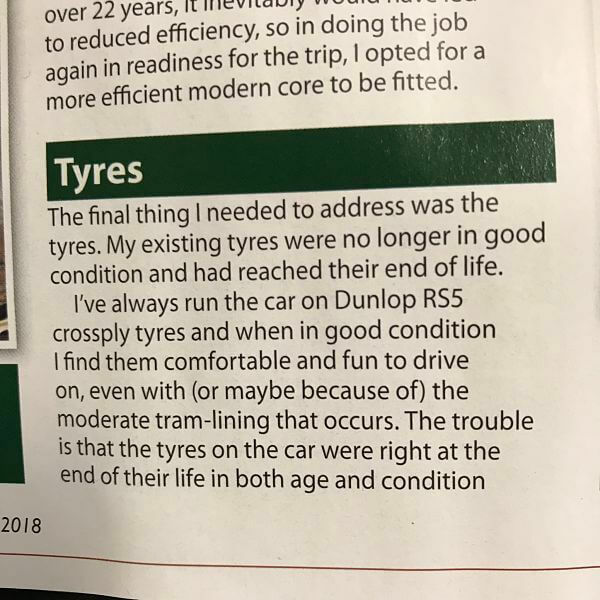 Which is a shame because these tyres are both period options that people have used historically, but with todays modern roads the extra gearing of a bit more height is crucial. A few years ago Avon developed a new radial tyre was developed ; 670VR16 Avon Turbosteel, which though it is 722mm tall and is pretty much there. Sadly they don’t look quite right like the Michelin or the Cinturato, but they do offer the best gearing on a radial tyre and the handling is dramatically improved compared to a Crossply. !!!! IMPORTANT NOTICE - when running these radials, it is critical to increase the tyre pressure to a minimum of 36psi !!!!! !